If you're a Woodsman, you're going to chop up trees, it's just kinda what you do. Now, if you happen to be made up of shiny silver tin, you're going to want the tools to match. That's where this Silver Tin Woodsman Axe comes in handy. Whether you plan to chop down some apple trees or fight off an army of flying monkeys, you can't go wrong with this shiny axe... Oh, that's right we said flying monkeys. One doesn't simply adventure through the wondrous land of Oz without running into some sort of trouble. Wicked witches, mischevious monkeys, and even apple throwing trees lurk around every corner. So yeah... you may want to keep a firm grip on this bad boy. If you're ready for the adventure of a lifetime, or if you just landed a job as a woodsman in Oz, grab this accessory and you'll be ready to go! Just watch out so that crooked witch doesn't curse your new axe... it didn't really turn out so well for the Tin Man. Must have for the tin man costume. Sturdy prop. Nice prop for the price. 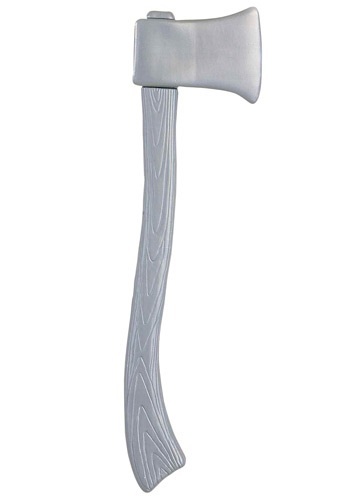 It's a plastic axe. Not much else to say. It really made the outfit for the price. I would buy again.